The pipa, a sort of Chinese lute, produces music of exquisite delicacy in the hands of a master player. But Wu Man, the world’s most famous practitioner on this classical Chinese instrument, has other ideas. On the San Francisco stop of her United States tour — and in dramatic contrast to the intricacy, purity, and clarity of her own music — she brought along the rough-cob, high-energy showmanship of the Huayin Shadow Puppet Band, an eight-man gang of musicians from the mountains of central China. Now living in southern California, Wu Man plays solo recitals and appears with Western ensembles (often with the Kronos Quartet). 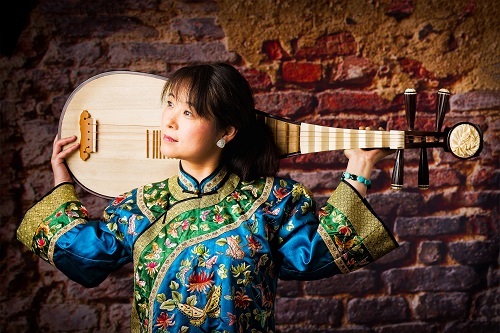 She is one of the original members of the Silk Road Ensemble, the multi-national musical entourage founded by Yo-Yo Ma and featured in the wonderful 2015 documentary, The Music of Strangers. In the film, the Chinese village of Huayin had its moment in the sunshine: The local band jumped off the screen in a segment that followed Wu Man to their village in Shaanxi province, a farming region that lies between Sichuan and Mongolia. The band comprises full-time farmers and part-time musicians who play weddings and funerals, and do shadow puppet shows. This is street music of tremendous vivacity and spirit, its rhythmic melodies played on erhus (Chinese upright violin-like instruments) and punctuated by Chinese cymbals, gongs, and a narrow wooden bench struck by a block of different wood. At this concert, Wu Man’s much more intimate music served as introduction and intermezzo between selections by the band in an event presented by Cal Performances at Hertz Hall at the University of California. The afternoon concert opened with ‘Flute and drum music at sunset’, a lyrical moment that expresses contentment and peace. She followed that with “Ambush From Ten Sides,” an example of what she called ‘martial style’ playing, a tour-de-force that pushed the boundaries of the instrument to achieve a visceral sense of high drama. But the highlight might have been ‘Dance of Yi’, which she introduced as ‘the first modern composition for the pipa’. Noting that pipa music was traditionally written only as a skeleton sketch to improvise with traditional flourishes, it ushered in a era of notated writing for the instrument. It’s a beautiful piece, apparently simple and sweet, but the ear could hear extra nuances. What she and the band share is unbridled joy. The pipa is a smile or a sigh. The band channeled the same high energy as rock-’n-roll, especially in moments when percussionist Dang Anhua picked up his bench, and rushed downstage to bring his wood block crashing down on the final note. Their music has titles translated as ‘Three Heroes Do Battle With Lü Bu’ and ‘The General’s Orders Stir the Mountains and the Rivers’, and often consists of rhythmic call-and-response shouts against a flow of melody from several erhus, spicy percussion interruptions, and the occasional interjection by a trumpet-like instrument neighing like a horse. There’s beauty, too, coming from the erhus and the banjo-like yueqin, played by lead vocalist Zhang Ximin, which came out most appealingly in their shadow puppet play, ‘Round Sun and Crescent Moon in the Heavens’. The puppets, manipulated by Ximin and his brother Shimin, produced lifelike and richly colorful images that delighted with humor and charm. A beautifully shaped solo improvisation on pipa provided a soothing breather between two aggressive pieces in the puppet sequence. The 80-minute performance concluded a with gently rhythmic pipa solo, ‘Three and Six’, followed by a rousing finale that landed with a thump from Dang’s bench.